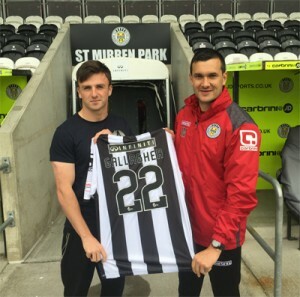 When news broke yesterday that Calum Gallagher had made a sharp switch to St Mirren Park, it came as a major shock. With Gallagher last week professing his eagerness to be a long-term player for Rangers, and insistence that he saw himself as vying for a first-team slot at Ibrox, it was assumed that manager Mark Warburton felt the same given the new boss’s well-documented focus on the youth players. However, tellingly when the boss praised the youth systems and their graduates during his first press conference after being appointed, he specifically set about naming Barrie McKay and a few others, but noticeably omitted Gallagher. Gallagher also had not featured in any capacity during the first three significant matches of Warburton’s tenure – the friendly v Burnley, the Petrofac clash with Hibs and the League Cup win over Peterhead – none even saw the former Cowdenbeath loanee on the bench. His only brief cameo was a 30-minute appearance v Ayr from the subs’ bench, and it seems evident now he failed to impress during it. Confusingly, this deal to St Mirren has been called a “transfer agreement”. It is unknown at this time if a development fee exchanged hands, or what aforementioned agreement actually entails. Even more bizarre is that it is for only one year. “If they are good enough, they are old enough but they do have to be good enough”. Roughly translated he is not just going to use Academy-reared players for the sake of sentimental slush, but for the sake of truly improving the team. Sometimes fans get fixated on using players developed within the Club, but it is worth remembering they are not all good enough to make the grade; and four managers (of varying abilities) came to a consensus that Calum is not good enough, even if some/many fans disagree. But Warburton believes Gallagher does not have what it takes, if that is indeed the conclusion he has drawn, fans have to buy into his vision and trust that judgement. Rangers are going places, and unless the manager ever gives fans reasons to doubt his abilities, faith is required. "WHO"!!? Know's!? BUT! ?, "Ian Murray" OBVIOUSLY!! SEE'S!! SOMETHING!? THERE!! "WHIT'S!? THE! BETTIN!?" HE! PLAY'S!? & SCORE'S!! Friday!! ALA? "Stevie Thompson"
Shocked thought he was a real prospect for the future. Same with murdoch the devdlopment team havent been dominant in the last couple years hopefully under warbs and co the youth will be the future like ajax. Want to see the best young talent from around the globe at murray park not just scots. Thought he played well during his outings for the first team and recall his introduction against Dunfermline including a goal as a great way to start, but he was not allowed to sustain that in the first team as Ally dropped him and loaned him out. Think that Warburton came at the wrong time for him with the eye now more on Ryan Hardie to progress to the first XI plus another striker likely to arrive on loan later this month. Calum Gallagher moving to St Mirren this week was definitely a surprise for most Rangers fans, but it could be that W & W are being double wide with this masterstroke. With the move called a transfer agreement, could it be that he is only on loan for a full year with St Mirren paying his wages whilst still signed to Rangers. This would give them a full year to watch how he progresses in their first team as a player and then decide whether to make him an offer to extend his contract at Rangers. I could be wrong of course and Mark Warburton felt that he was never going to make it in the Rangers first team. There could be another reason for the agreement as Rangers are seen to be transferring a good young prospect to one of their main rivals. Not unlike Scott Allan and the on going Rangers situation. Good luck to Calum every time I seen him play he was very good and I was always wondering why he never got more game time was hoping after loan spell he would step up but hey ho we march on and I am sure this young lad will make an impression going forward at whatever level. It might just be the case that he isn't the TYPE of player that the new management are looking to bring into the club. That doesn't mean that he isn't a good player of course. Rangers seem to be looking for players with good technique and pace, but they are playing really high tempo stuff as well. Not all players will have the 'stamina' required to play like that for 90 minutes, week in week out. The training seems to have been pretty intense. We can all see that they are in great shape already. Once they peak, they'll feel like supermen. They will taper off in the latter part of the season, of course, so the full squad will be utilised to try and maintain the high standards until the end. I don't know if Calum is suited to play flat out like that week after week. It could be something, completely, different that the management were concerned about. If, indeed there is a problem and he hasn't just been sent out on a type of loan. Best Wishes to him in any regard. Sadly he has too wait....This guy has it and hope he stays with us. Good luck mate but maybe not tomorrow!